Anchorage of Tarpon Lake is a 55+ adult retirement community of charming single family homes in the East Lake section of Palm Harbor. This quaint real estate neighborhood was built in the 1970s. The Anchorage consists of two and three bedroom homes of spacious living and offer one and two car garages. 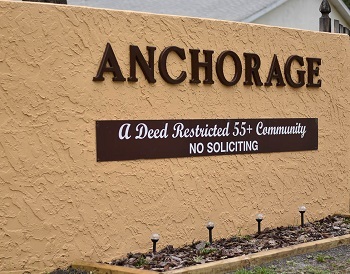 The homes in The Anchorage average approximately 1600+ square feet of comfortable living space. The homes for sale in this subdivision are reasonably priced with a low homeowner association fee. The Anchorage accommodations of a community pool and recreation building are some of the additional reasons for this being a marvelous community for homeowners to enjoy. With The Anchorage active social calendar, it may be difficult to enjoy the over abundance of local restaurants, shopping malls, parks, and hope you can find the time to delight in the sunset at the most beautiful beaches on the gulf coast of Florida. Walk to the most popular John Chesnut park which is just steps from this lovely community. There is also a major shopping center and pharmacy within walking distance as well. This could be the best kept secret in East Lake, FL. for retirees. Come see it today and get in on a great deal! Selling your Home in Anchorage? Contact us today at Lipply Real Estate where you will be forwarded directly to one of our agents who can help you in the process of selling your home. Here at Lipply Real Estate we STRIVE to make you the best possible sale of your home. Don't miss out on an opportunity when you could just call us today and start by getting a quote!